A 1.4G - DOT classification for explosives that pose a limited hazard (consumer fireworks). Aerial Firework - a device that functions in the air, such as a shell, Roman candle, rocket, or repeater. Aerial Shell - spherical or cylindrical-shaped firework propelled into the air from a mortar, where it bursts and ignites the contents inside. The most common and well-known type of firework. AHU - Is an acronym for "the authority having jurisdiction". Generally refers to the fire marshal, local police department, local fire department, or whoever is responsible for regulating and monitoring fireworks in your area. American Pyrotechnics Association (APA) - Trade association for the fireworks industry. Ash Can - another name for a silver salute. True ash cans became illegal in 1966. Legal ash cans today contain only 50 milligrams of flash powder. Assortment - a variety of fireworks sold in a box. Comes in all different sizes, and usually includes aerial repeaters, fountains, spinners, rockets, and firecrackers. B Barrage - a group of items fire all at once. BATFE- Bureau of Alcohol, Tobacco Firearms and Explosives. Federal agency which regulates the licensing, importation, manufacture, distribution, and storage of 1.3G display fireworks. Battery - a group of similar items that is constructed as a single bundle, such as a missile battery. Bottle Rocket - a small rocket that is approximately the size of a standard firecracker, one and one-half inches long with a thin stick attached to it that is approximately 12 inches in length. Bottle rockets can contain whistle effect and may contain a report (loud bang). Branching - sparks that split up into smaller sparks, which looks similar to a branch. Break - a compartment of shell containing effects. Multi-break shells contain many of these compartments which result in several burst in the sky. Brick - many bundled packs of firecrackers which resemble a red brick. Brocade - a spider-like shell burst pattern. Generally has silver tail effect, and is brighter than willow or tiger tail-style. C Cake - a repeating aerial firework consisting of many shots, named after its usual short cake-like appearance. Cakes consist of one fuse attached to several tubes (sometimes hundreds) which fire in sequence, launching a variety of effects into the air, including comets, crossettes, whistles, reports, mines, spinners and flying fish. Candle - short term for roman candle. Cherry Bomb - an old cherry-sized salute filled with explosive flash powder and covered in a red sawdust/glue coating. Banned in the US since 1966. Chrysanthemum - a dense, spherical burst of stars that retains its shape before fading. This is the most well-known type of firework shell break. Class B - obsolete DOT classification for 1.3G display fireworks, though still commonly used amongst those in the fireworks business. Class C - obsolete DOT classification for 1.4G consumer fireworks, though still commonly used amongst those in the fireworks business. Comet - a type of star that leaves a trail of sparks as it flies through the air. Commercial Fireworks - sometimes referred to as display fireworks, these are professional fireworks that are regulated by the ATFE and generally require a special license to buy, store, and use. These fireworks are commonly seen in large displays sponsored by a city or other large organization. Consumer fireworks are not commercial fireworks. Cone- a type of fountain in the shape of a cone. Confetti - paper streamers in multiple colors that are propelled by a gas cartridge or by a small pyrotechnic charge. Consumer Fireworks - fireworks that have been approve by the US Consumer Product Safety Commission (CPSF). Fireworks that are approve by the CPSC must be able to withstand 350 degree temperatures for two days, must not be able to explode with mechanical shock, are limited to 500 grams of composition, and can not contain aerial burst that have more than 130 milligrams of flash powder. If the item has not been approve by the CPSC it can not be classified as consumer fireworks. CPSC - The US Consumer Product Safety Commission, a federal agency responsible for testing an approving all consumer fireworks. The CPSC website can be found at https://www.cpsc.gov/. Crackle Effect - a fireworks effects that sounds like hundreds of snaps or crackles, usually accompanied by an aerial gold lace visual effect. Crossette - a type of comet that breaks into multiple comets, usually forming a cross shape. D Dahlia - a burst pattern similar to a peony, but with larger and fewer stars. Day Time Effect - a type of fireworks that can be enjoyed better during the day time than the night time. Includes smoke items and parachute items. Department of Transportation (DOT) - United States agency that regulates the classification and transportation of fireworks and other explosives. The DOT created the 1.4G classification for consumer fireworks. Display Fireworks - Fireworks for professional use, also known by the DOT classification 1.3G or ' UNO335. Formerly known as "Class B" fireworks. Dragon Eggs - clusters of crackling sparks in the air. Dud - a firework that fails to ignite. F Falling Leaves - a beautiful aerial effect that consists of glowing embers that tumble slowly in the air, flickering back and forth as they fall back to earth. Finale- the last portion of a firework display. During a finale, the largest, loudest, and most exotic fireworks are ignited in huge quantities and in a short amount oaf time, creating an intense and beautiful display. Fish - a type of aerial effect that looks like a swarm of glowing objects flying around randomly. The effect is created using small chunks of fast-burning fuse that actually propel themselves through the air when lit. Firecracker - a fireworks item containing flash powder and wrapped in paper with a fuse attached when the fuse is lit, it burns down inside the paper until it reaches the flash powder. The deflagration of the flash powder results in a loud bang. Legal consumer firecrackers are limited to a maximum of 50 milligrams of flash powder. Firework - a device that functions by combustion to create visible and audible effects for the purpose of entertainment. In the United States fireworks are divided into two groups: those that can be bought by the public (Consumer Fireworks) and those that can only be used by professionals (Display/Professional Fireworks) Flitter - Similar to glitter, flitter is a type of star that contains bright flashes of light in the trail the star leaves behind. Floral Pattern - an aerial pattern that resembles a flower with points of light that streak outward from the center of the break. Fountain - firework that produces upward showers of sparks. Also called gerbs. Fuse - an item resembling a string or wire that is used to light a fireworks device. G Glitter - a tail effect that contains flashes of light and small explosive bursts lasting several seconds. Go-Getter - a self propelled star that "swims" in the sky like a rocket without fins. Ground Item - ground items are any item that is lit on the ground and does not shoot objects into the sky. This includes fountains, sparklers, snaps, snakes, pops, smoke balls, and other items. I Illegal Explosives - any salute that contains more than 50 mg of flash powder, such as M-80's, Cherry Bombs, and Silver Salutes. They are not fireworks. Illegal explosives are extremely dangerous, and have caused many injuries. J Jumping Jacks - Similar in appearance to a firecracker, jumping jacks spin rapidly and emit red and green sparks. L Ladyfinger - tiny firecrackers. Lift Charge - charge beneath a shell (usually attached to the bottom of it) consisting of black powder used to propel the device into the sky. M M80 - M80's are red in color, one and one-half inches long, 5/8 of an inch in diameter, with a green waterproof fuse sticking out the side. It contained two grams of flash powder and was responsible for hundreds of serious injuries due to its powerful blast. These items were banned by the CPSC I 1955, and made illegal by the BATF (now ATFE) in the 1970's. Legal M80's today contain 50 milligrams of flash powder, which is about 1/40th of the original M80. Illegal 80's sometimes contain compositions that are sensitive to shock and can injure or kill people. If you like having full use of your fingers, hands, and eyes, don't mess with illegal M80's Mine - an aerial device that shoots stars into the sky in an upward spray pattern. Missile - in fireworks, a missile is a sky rocket that does not have a stick for guidance; instead, it may rotate to give it some stability as it lifts off, or may be shot from a tube like Saturn Missile Batteries). Mortar - tube from which aerial fireworks such as shells and mines are ejected. Can be made from cardboard, high density polyethylene, or fiberglass. Mortar Rack - a wooden or metal from that contains many mortars. Multi-break - shell with numerous compartments, each one bursting separately. Multi-Shot Aerial - this is another name for a cake or repeater. N NFPA - an abbreviation for the National Fire Protection Association. The NFPA is responsible for setting uniform national standards for fireworks use, manufacture, transportation, and storage. NFPA 1122 sets standards for Model Rocketry. NFPA 1123 sets standards for using display fireworks. NFPA 1124 sets standards for manufacturing and transporting fireworks. NFPA 1125 sets standards for manufacturing model rockets. NRFPA 1126 sets standards for the use of proximate (indoor) fireworks. NFPA 1127 sets standards for the hobby of high-power rocketry. The NFPA website is: https:////www.nfpa.org/. Novelty - a small firework shaped like an animal, vehicle, or structure. Novelties emit small sprays of sparks, crackle, and whistle and often move around on little wheels. P Palm Tree - an aerial effect that produces a gold or silver stem as the shell rises into the sky (known as a rising tail); followed by a brocade or willow effect that creates palm fronds. It resembles a gold or silver palm tree in the sky. Parachute - a paper projectile that is expelled from a mortar tube either as a single-shot item, or as a multi-shot effect in a cake. Pearl - single color star, launched from the ground. Peony - an aerial effect that looks like a spherical ball of colored lights in the sky. A very common aerial effect on most fireworks displays. 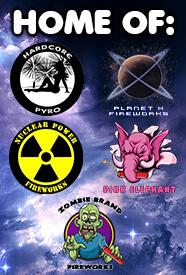 PGI - Pyrotechnics Guild International. PGI website is: www.pyrotechniciansguildinternational.com Pinwheel - see wheel. Pistil - a ball of stars in the center of another ball of stars. Another way to describe this effect is a small peony inside a larger peony. Planes - a term for a device that spins very fast and lifts high into the sky, only to explode ore burst into a special aerial effect. These are also called helicopters, sky flyers or UFO's. Punk - a stick of compressed sawdust that burns extremely slow, used for igniting consumer fireworks. Pyro - from the Greek work for "fire", used by itself as a nickname for a fireworks enthusiast.' Pyrotechnician - someone who builds or shoots fireworks. Q Quick Match - extremely rapidly burning fuse used to ignite multiple fireworks at virtually the same I instant. R Repeater - sometimes referred to as "cakes" or "multi-shot aerials", a repeater is a cluster of aerial tubes with a single fuse. The name "cake" was attributed to these because the cluster of tubes looks similar to a cake in size and shape. Once the fuse is lit, each of the tubes is fired in sequence. Cakes can have a variety of intricate aerial effects, including spinners, fish flower bouquets, comets, crossettes, reports, and other aerial effects. Cakes are the most popular consumer fireworks items outside of sparklers and firecrackers. Report - a report is another name for a bang. Items with reports explode with a bang. This term is most often used with rockets and cakes. Rising Effect - things such as whistles, stars, crackles, etc. that are released by a shell during its ascent. Ring Shell - a shell that produces a ring as its aerial pattern. Rising Tail - a gold or silver tail effect that is created when a shell is shot into the sky, similar to the trunk of a tree. Commonly used with palm tree shells. Rocket - a tube-like pyrotechnic device made out of a paper tube that propels itself into the air in order to fly. There are many different kinds of rockets, including sky rockets, bottle rockets, and missiles. Roman Candle - a paper tube filled with composition that shoots flaming balls out one end of the tube. Most roman candles have five or more balls. Roman candles should never be held in your hand. Instead they should be planted securely in the ground and pointed away from people and flammable objects. A good way to shoot roman candles is to get a five gallon pail and fill it with kitty litter or sand. The roman candles can be easily inserted into the bucket of kitty litter or sand and fired safely. S Salute - loud report without stars or colors Safe and Sane - consumer fireworks that do not explode or contain aerial effects. Includes: fountains, novelties, smoke devices, sparklers, and snaps. Shell - short term for Aerial Shell. Single -Shot Aerial- a mortar tube with a shell already installed in it. These items generally have a fuse sticking out the side of the mortar at the base of the tube. While these are single-shot, one time use items only, these items can produce some spectacular effects. Smoke Item - any item that produces a smoke effect, including smoke balls and aerial items that produce smoke instead of light or noise. Smoke items are generally used during the daytime. Snake - a small black pellet that, when lit, burns slowly to produce a long column of brittle ash that resembles a snake coming out of the ground. Snaps - paper balls that are filled with a cap composition that goes BANG when they are thrown at something. Snaps are generally safe for most kids to use. Sparkler - a stick with a coating of pyrotechnic composition that creates sparks when lit. While sparklers are generally considered safe, they are responsible for over eighty percent of the injuries due to fireworks each year. This is because people throw the hot sparkler wires on the ground and other people step on them. If you use sparklers, please make sure you have a bucket of water handy to place the used sparkler wires in when the sparkler burns out. Spinner - a type of star that spins in the sky and gives off large quantities of white light. Another name for a spinner is tourbillion. Star - a small pellet of compositions that produces a pyrotechnic effect. Stars are used in aerial shells, rockets, roman candles, cakes, and fountains to produce streaks or light, pulses, long golden tails, and other aerial effects. A single shell could contain several hundred stars. Strobe - a strobe is a blinking effect. When used in a shell with hundreds of strobe stars, the strobe effect looks like shimmering water in the sky. Strobes can be a variety of colors, including white, green, blue, and orange. T Tail - a burning trail that follows a star in the sky. Most comets have tails, and so do willow and brocade effects. Tourbillion - another name for a serpent. A tourbillion is a type of star that spins in the sky and gives off large quantities of gold, silver, or white light. These are generally constructed as a small paper tube with holes on each end that allow it to spin. Tube - another name for a mortar (see definition for mortar above). U UFO - a term for a device that spins very fast and lifts high into sky, only to explode or burst into a special aerial effect. These are also called helicopters, planes, or sky flyers. V Visco - a slow-burning fuse (usually green) used to make fireworks. W Wheel - a stationary device that spins and creates a circular ring of fire and sparks. These are generally nailed to a pole or a tree before they are lit. You should always be careful to make sure the area is free from flammable debris before you light a wheel as the sparks can carry ten feet or more. Whistle - high-pitched shriek caused by air rushing through a partly hollow tube. Wholesale Fireworks - Fireworks that are sold by the case. You can generally save twenty percent or more by purchasing fireworks by the case. Willow - Falling trails of sparks. Looks like a Willow tree.